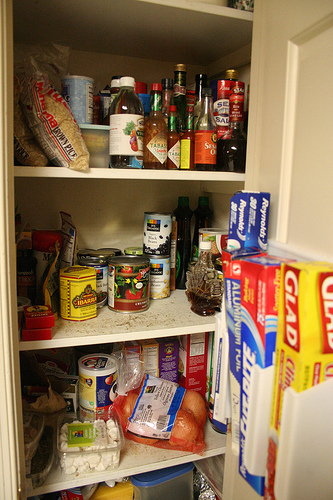 We’ve gone through your refrigerator and the freezer already, but this may be the most painful/liberating part of your kitchen raid, since so many junk food ends up here. So, take a moment to give yourself a pep talk before grabbing that garbage bag and opening your pantry. Dump this: Sugar-filled cereal. Sugar-filled cereal is basically another form of junk food, and will only add inches to your waist. * Add to shopping list: Slow-Cooking, Steel Cut Irish Oatmeal. There is a huge difference between instant, sugar-filled oatmeal and steel cut oats. Even plain rolled oats without added sugar is not comparable. Dump this: Refined/White Bread/Rice/Pasta. These highly processed products turn rapidly to blood sugar and promote weight gain and a plethora of other health problems. Do not buy “white” bread, rice or pasta – especially if you want to lose weight. *Add to shopping list: Whole Grain Bread/Rice/Pasta is a little bit less bad. But if you really want progress, abandon refined carbs altogether and up your indulgence of tasty, nutrient-packed vegetables and berries. *Add to shopping list: Almonds. The key to making this snack a winner is to practice portion control. Place a handful of almonds into individual bags for pre-portioned snacks. *Add to shopping list: See previous suggestions above. That completes your self-guided kitchen raid. I encourage you to schedule a recurring appointment on your calendar to raid your kitchen every couple of months as a way of keeping yourself on track. If you have any other thoughts or tips, please comment below! Talk with your family members about the healthy changes that you’re making, and try to get everyone’s support. You know that weight loss comes as a result of healthy eating combined with consistent, challenging workouts. Call or email us today if you’d like to discuss how we can help you to get started on a fitness program with a personal trainer in Los Angeles that will get you on the fast-track to your best body ever.